Richter Industrial has been fabricating custom machine and perimeter guarding, for over 10 years. We specialize in the fabrication, and assembly of guarding constructed using Lightweight Aluminum Extrusions, and High Strength Polycarbonate, Wire Mesh, or Steel panels. We offer full design services or will custom build for your specifications and drawings. Our customers range from, OEM Manufacturers, to Aerospace. Acoustic Barriers - used to reduce noise from air compressors and other equipment and protect workers from long term hearing damage. We use adhesive foams affixed to the inside of the required barrier design to block out sound creating a more user friendly work environment. Entry Barriers - for Driver security and Warehouse access control. Creating a safe and secure warehouse environment for your staff and visitors is a requirement for every business. Entry access barriers allow you to secure your inventory and ensure delivery drivers have a safe place to wait while loading and unloading. Access Controlled Enclosures - for Tool Cribs or to protect high value or sensitive inventory. Operating inventory needs to be kept secure. If automated dispensing systems are not an option for your business, consider added an access controlled enclosure in your warehouse to store hazardous, valuable, or easily pilfered inventory. Welding Barriers - Modular or fixed barrier options to help shield workers from weld flash. Warehouse Office Enclosures - to provide temporary or permanent office space or inspection area in your warehouse. Manufacturing area Perimeter Barriers - to safeguard workers against debris or coolant spray from machinery. Why choose a barrier guard? Recognizing that work places often need either temporary or permanent enclosures in order to provide safety, security, or for the protection of assets. Richter offers custom fabricated solutions using our lightweight Aluminum framing system to create and modular, expandable, and reconfigurable solution for your enclosure needs. Leveraging our over 60 years of experience in the industrial Supply and Sourcing business Richter is uniquely set up to ensure you receive quality Machine Guarding and Industrial framing products, at a competitive price. Our expertise ensures you get quality where it matters, and still get great value from the global sourcing capability Richter is known for. Does the guarding meet the minimum standard requirements? Does it prevent workers from making contact with moving machine parts and robots? Is all auxiliary equipment guarded adequately? Can safe, ergonomic operation of the machine be performed? Is the point-of-operation safely guarded? Pick your panel, pick your frame! 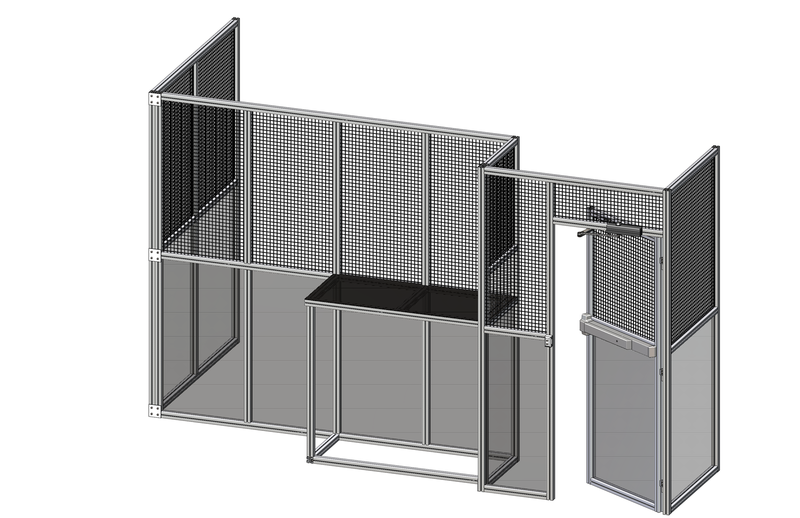 When you select a Richter Machine Guarding, Barriers or Enclosure solution you get the options you want. Select from an array of Panel options including: Aluminum, Steel, Wire Mesh, Polycarbonate, or Plastic. Our range of in stock aluminum profile framing allows you to pick the shape size and finish you want for your finished product. Employers, supervisors and workers have responsibilities under the Occupational Health and Safety Act (OHSA) and Regulations for Industrial Establishments. Providing appropriate information, instruction and supervision to protect workers such as training in lockout and guarding procedures (OHSA Section 25(2)(a)). Ensuring equipment is maintained in good condition by replacing and/or repairing damaged machine components (OHSA Section 25(1)(b)). A moving part may endanger workers (Industrial Regulation Section 24). A machine has an in-running nip hazard (Industrial Regulation Section 25). Cleaning, oiling, adjusting, repairing or having maintenance done on machines (Industrial Regulation Section 75). Locking out control switches or other control mechanisms, or taking other effective precautions to prevent starting, when the starting of the machine could endanger a worker (Industrial Regulation Section 76). Ensuring workers comply with the OHSA and its regulations (OHSA 27(1)(a)). Advising workers of any potential or actual health and safety dangers (OHSA 27(2)(a)). Following lockout and guarding procedures (OHSA 28(1)(a)). Reporting machine hazards and other workplace hazards to their supervisor (OHSA 28(1)(c)). Using or operating machinery in a safe manner (OHSA 28(2)(b)). Using or wearing protective devices or clothing required by the employer (OHSA 28(1)(b)). Air systems, lighting rigging, machine guards you name it we build it. If you wish to get a custom project started click on "concept development" upload a sketch or design you have in mind and our team will contact you and get things started today!